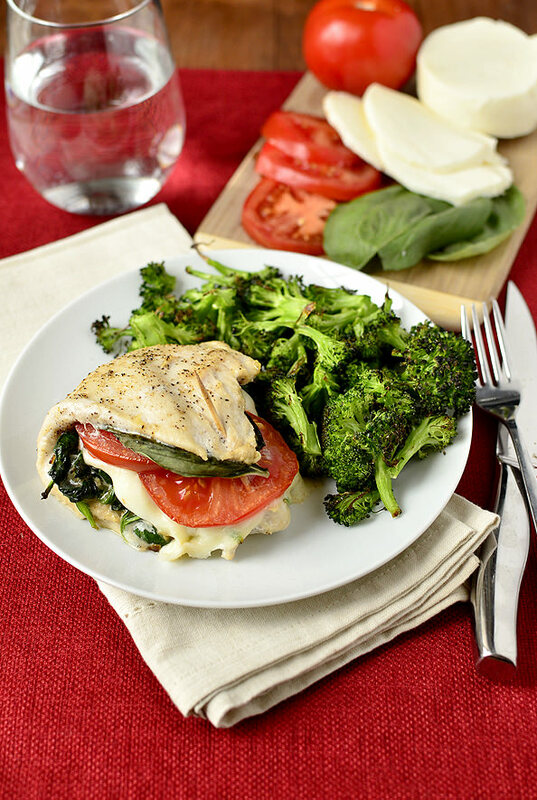 Caprese Stuffed Chicken is a quick and easy gluten-free dinner recipe that’s perfect for busy weeknights. Fresh and fast! We had a semi gorgeous weekend ’round these parts, and spent the past couple of days in and out, here and there, catching up on errands, and spending time with friends and family. Ben and I have also been working on a big project lately that’s been taking up a lot of our weekends, which is why my posting schedule has been a bit off lately. I loathe being vague, but hopefully it should all be wrapped up soon and I can share what we’ve been up to. Whee! In the meantime, let’s talk about stuffed chicken, shall we? 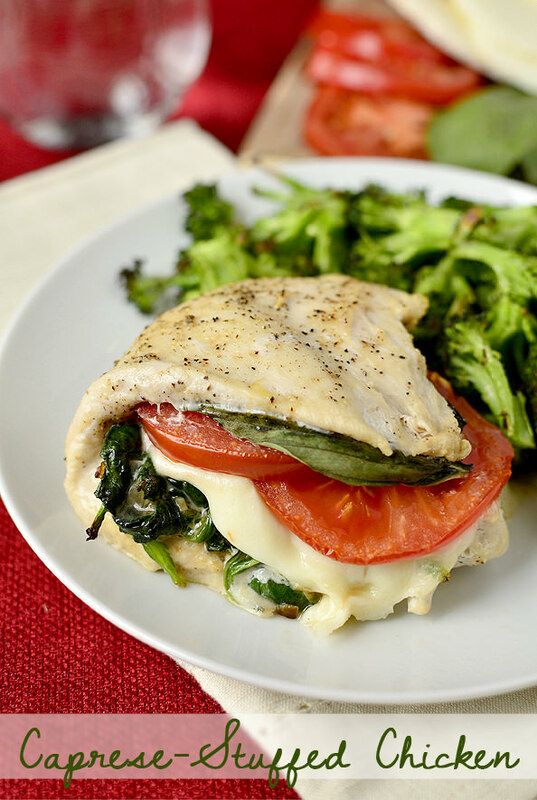 Caprese Stuffed Chicken to be exact! If there’s anything I loathe more than being vague, it’s rolling pounded out chicken breasts around a stuffing. I know, what a seriously lame thing to moan about, it’s just that I rarely have the time or energy (read: patience) to do such activities. 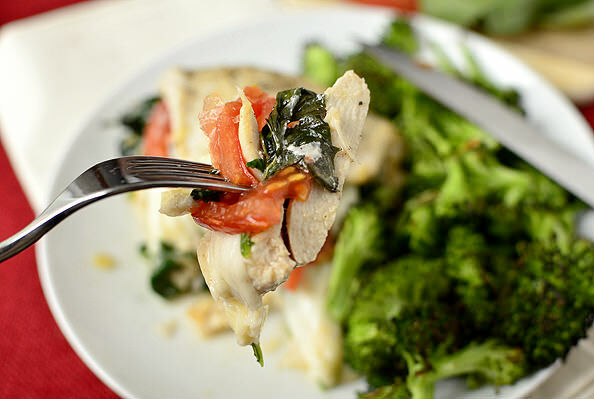 Simply FOLDING chicken over a fresh stuffing of sauteed fresh spinach, melty mozzarella cheese, juicy vine-ripened tomatoes, and herby fresh basil though? All over it. I got the idea to fold chicken over a stuffing after trying to figure out what to do with some leftover spinach + feta filling from the Easy Spanakopita Bites I made last week. I used part of the filling to pump up scrambled eggs (to die) and the other half I packed onto pounded out chicken breasts, folded one end over, and then quickly baked ’em in a hot oven. Ben and I both agreed it was one of the best chicken dishes I’ve made to date. The filling was super yummy, and the chicken stayed nice and moist, too. Instead of posting the same filling recipe again though, I decided to get really light and fresh, and prepare a Caprese filling to stuff inside the chicken instead. This is freshness, and easiness to the max, people! 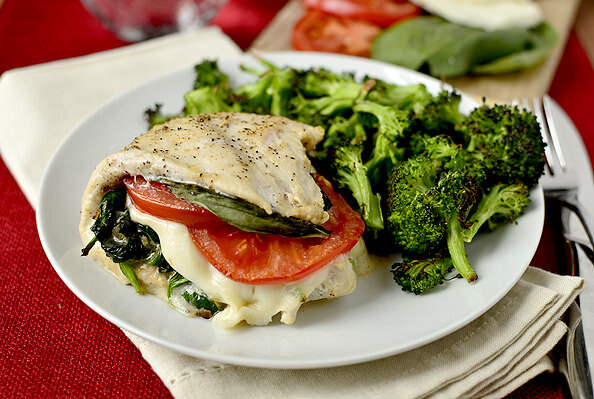 Start the Caprese Stuffed Chicken by preparing the sauteed spinach that will serve as the base for the caprese ingredients. 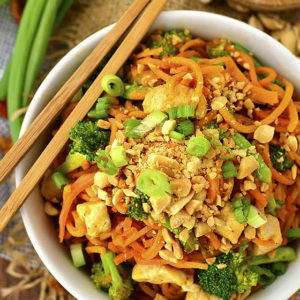 It’s an incredibly easy way to pack more veggies, and flavor, into this dish. First saute 1 small minced onion in 1 Tablespoon extra virgin olive oil until translucent then add 2 minced garlic cloves and saute for 30 more seconds. Next add 6 cups baby spinach and saute until wilted, about 2 minutes, then remove from the heat and cool slightly. 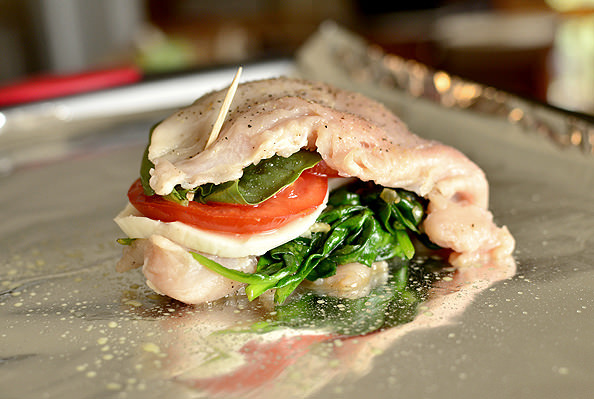 While the sauteed spinach is cooling, pound 4 chicken breasts until very thin. 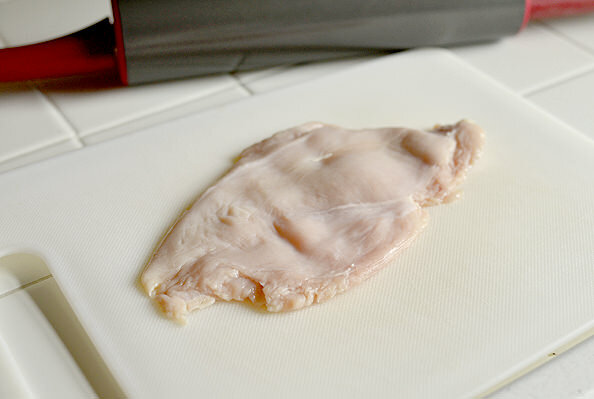 I lay mine out on a cutting board (I have one that I only use for poultry and meat) then cover with saran wrap or Glad press ‘n seal. Next, use something heavy like a rolling pin or meat mallet to pound the chicken out. Brush both sides of the chicken with extra virgin olive oil and season with salt and pepper, then place 1/4 of the spinach mixture onto 1/2 of the chicken. Follow with 1oz sliced mozzarella cheese, and a few slices of vine-ripened tomato. Finish up with a few fresh basil leaves, a drizzle of extra virgin olive oil, salt and pepper, then fold the other half of the chicken over and secure with a toothpick. 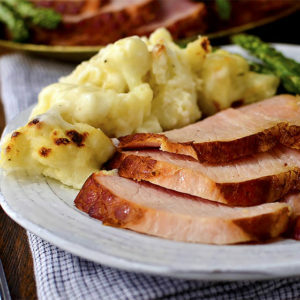 Place onto a foil-lined, nonstick-sprayed baking sheet then bake for 12-15 minutes at 400 degrees. Quick, right?! These chicken breasts would be DIVINE drizzled with reduced balsamic vinegar, or even warmed balsamic vinaigrette. I went the purist route today, and served ’em with roasted broccoli. That’s broccoli tossed with EVOO, salt and pepper then baked at the same time and temp as the chicken. Whabam! 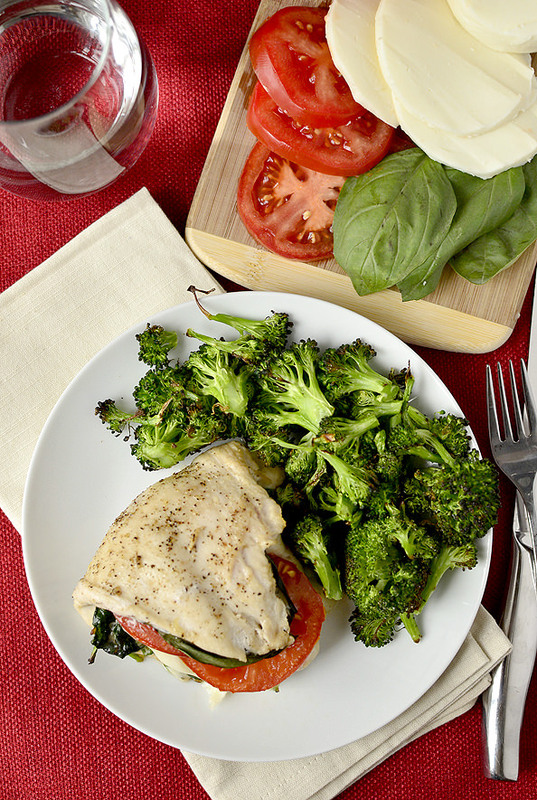 Caprese Stuffed Chicken is easy to assemble and fast to prepare. 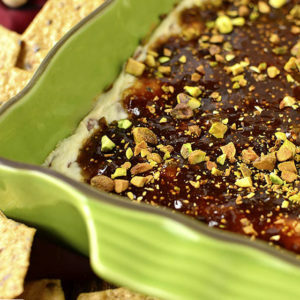 Perfect for busy weeknights! Preheat oven to 400 degrees then line a sheet with with foil, spray with nonstick spray and then set aside. 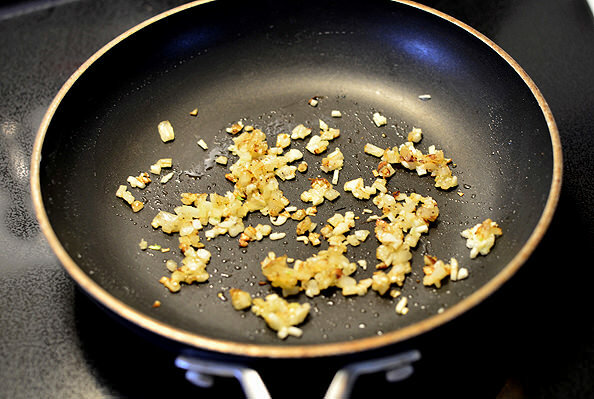 Heat oil in a large skillet over medium heat then add onion, season with salt and pepper, and then saute until translucent, 3-4 minutes. Add garlic then saute for 30 more seconds. Add spinach then cook just until wilted, 2-3 minutes. Set aside to cool slightly. Brush and season both sides of the pounded chicken breasts with extra virgin olive oil, salt, and pepper. Mound 1/4 of the spinach mixture on one end of the chicken breasts, then layer on sliced tomatoes, mozzarella cheese, and fresh basil. Drizzle with extra virgin olive oil then sprinkle with a bit more salt and pepper. Fold other end of chicken over and secure with a toothpick. Place onto prepared baking sheet then bake for 15 minutes, or until cooked all the way through. There is no better way to enjoy broccoli then simply seasoned and roasted, I’m telling you. I like to turn all of them so their crown or “trees” are face-down on the baking sheet. They get super crisp that way! 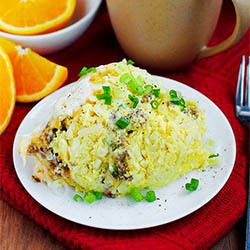 Hope you enjoy this fresh and easy dinner idea! 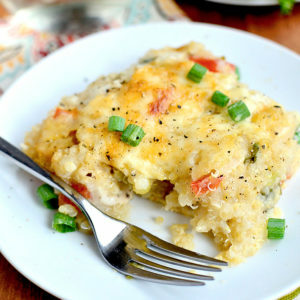 This looks super delicious, I’m going to add this to the bookmarks to try soon for dinner. I like trying new things with chicken instead of the usual, so this is great. Yum, this sounds amazing! I love caprese recipes! I love this! I’ve started my heirloom tomatoes indoors and I’m dreaming about all things caprese these days. How do you keep the cheese from spilling out? There’s nothing I hate more than when you stuff something with cheese only to find that it leaked out and is stuck to your cookie sheet. It actually didn’t leak out much at all – just a tiny bit on one side! Oh my gosh, how easy is that! Definitely trying this one. Oh yes, definitely a winner! Roasting broccoli is my favorite way to eat it, so good! Drooling! 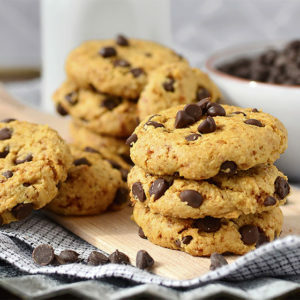 I’m not eating dairy right now and might have to break that rule for this recipe, yum! We love Caprese salads in our house so this would definitely be a hit! So gorgeous and wholesome! I love all the colors, too! Caprese is my favorite spring meal and this looks like a perfect way to get my fill even more often. Thanks, Kristin! What a gorgeous dinner! I can almost taste it your pictures are so pretty :) Can’t wait to try this one out! Sp pretty! Love caprese! The colors always make me happy! Love this take on caprese, Kristin! These flavors are so delicious together, and I love the look of that melty cheese. 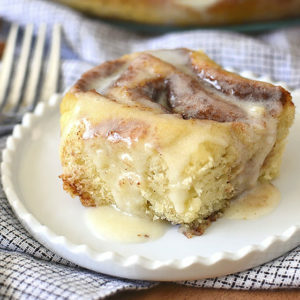 I think this may be on the menu for us tonight! Great recipe. My guess is new house before the baby comes. Hey! 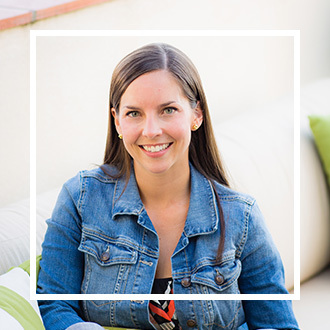 I wanted to let you know I nominated you for the Versatile Blogger Award! If you wish to accept this award you can follow the rules on my latest post. Totally up to you, but I love your blog and wanted to share the love. 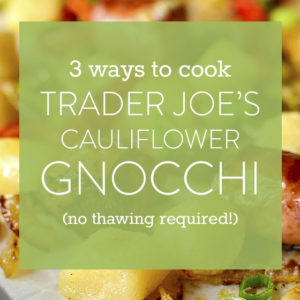 SOmething easy, delish, and healthy? I’m completely sold! Your vagueness is making me even more curious. I have a feeling it’s nursery related or maybe a new house :) Can’t wait to read what it is :) BTW, I watched your segment on KCCI, you look fantastic, God Bless!! I think this might become a weekly staple! 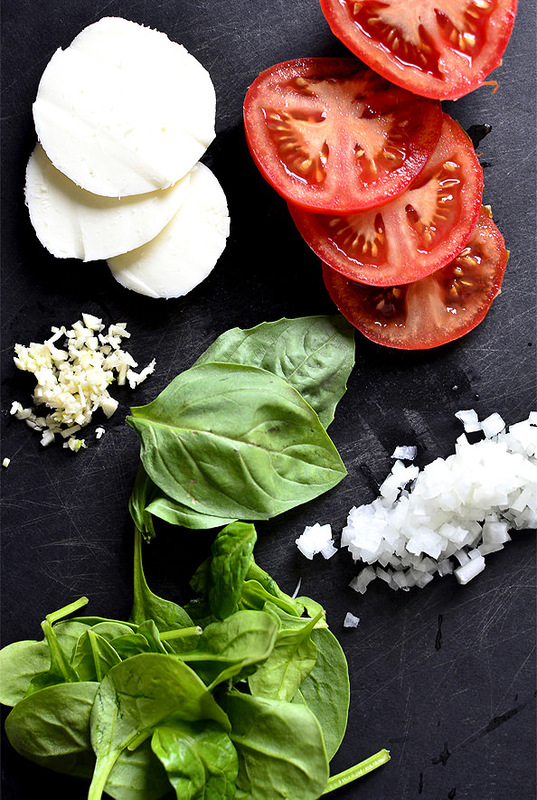 We love caprese everything around here, and I’m loving the healthy twist on it! 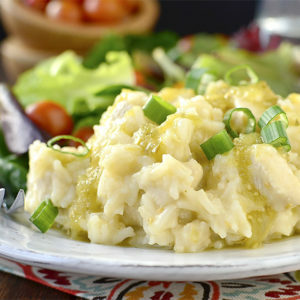 This looks like such a delicious Spring dinner! Thanks for sharing :) Loved watching your segment on KCCI, you’re a natural! I’ve been in love with anything caprese. 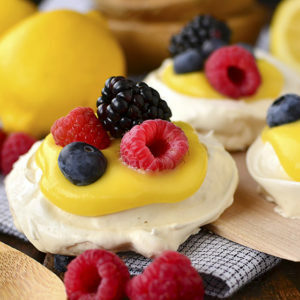 Can’t wait to put these on my menu for next week! Oooh, a secret project, a fantastic-looking recipe, and another awesome KCCI segment. Love it! Yeah! 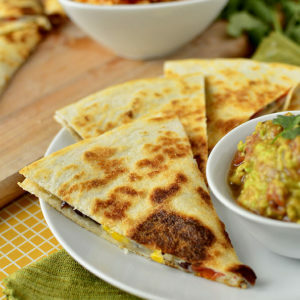 Super easy and sounds so tasty – love the flavors! I made this a little hesitantly last night. It looked delicious to me but I knew wilted spinach is something my hubby would be skeptical about. It was a huge hit! Definitely puting this into regular dinner rotation! 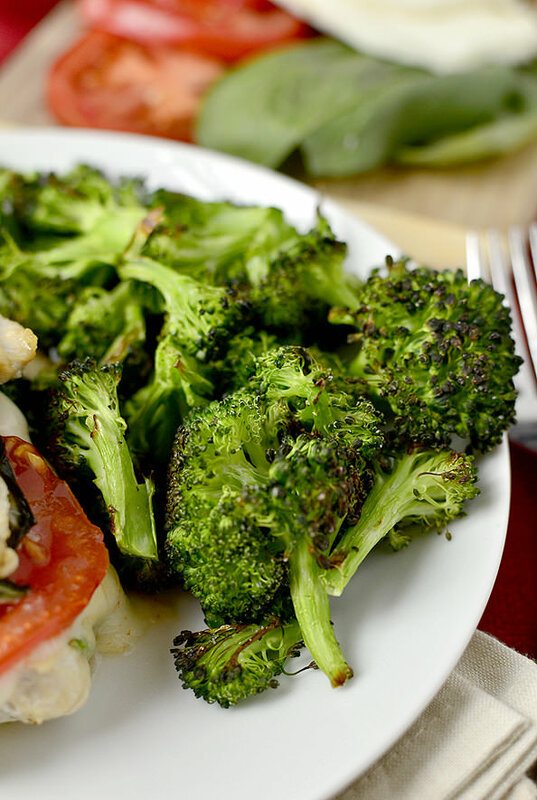 And roasted broccoli is one of the best ways to eat broccoli. For real. I just made this for dinner tonight. 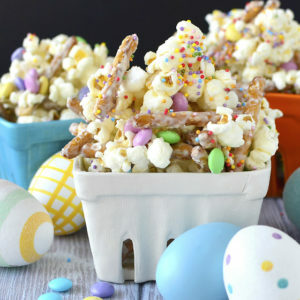 So easy and soooo good!! Thank you. Found this on Pintrest and made it tonight. 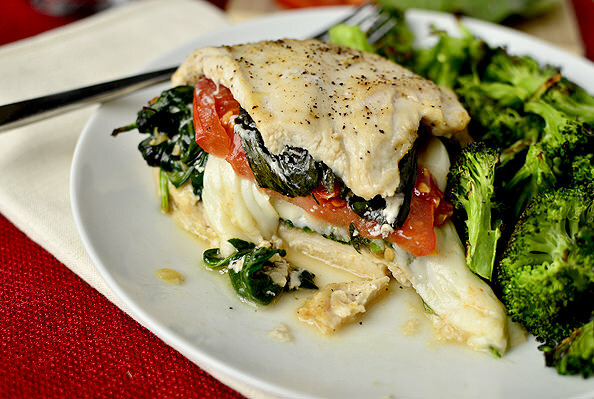 I looked at similar recipes, but picked this one because of the spinach – I had some I wanted to use up before it wilted. It was to die for! And yes, balsamic reduction was the icing on the cake. Thanks so much for giving me a recipe I know I’ll use often! Made this tonight for my family and it was really good! We had Caesar salad with it as we didn’t have any broccoli to steam. 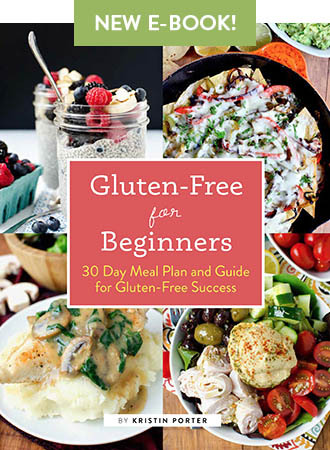 Thanks so much for healthy delicious recipes Kristen, love your blog!